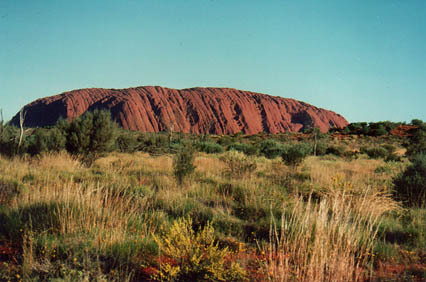 Ayres Rock (Uluru) (pictured) is a massive red rock that protrudes high from the flat featureless arid lands that surround it. 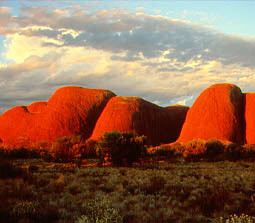 It is Australia’s most famous attraction with 400 000 visitors a year and is 464km southwest of Alice Springs. The Rock is most spectacular when viewed at sunset or dawn when the sun’s reflection makes turns it bright red. Many people take the climb up the rock. Walking around the base of The Rock you will see Aboriginal cave paintings showing The Rock’s cultural significance. Nearby is The Olgas (Kata Tjuta), also a dramatic rock formation protruding from the flat plains. Kings Canyon has high sheer cliffs is dropping down to a ferny creek bed making it an oasis in otherwise desolate lands.King Canyon is 300km away from Ayres Rock. Ayres Rock and The Olgas rock formation are in Uluru - Kata Tjuta National Park. Entry into the national park costs $15 per person. The entry ticket is valid for multiple entries for a period of five days. Services are at the nearby purpose built resort town of Yulara 18km north of Ayres Rock. The Olgas are 40km west of Ayres Rock, 58km from Yulara. Organised tours of Ayres Rock and the Olgas depart from Yulara (inquire at hotel receptions) and from Alice Springs. Without doubt Ayres Rock (pictured) is spectacular. It is the worlds largest single rock (or monolith). Despite its isolation in vast arid plains of central Australia it is must-see for any visitor for Australia. The rock is red but the intensity of the colour changes with the weather. Do not miss the sunset viewing when the colour changes to a deep brilliant red before going brown after the sun sets. Sunrise viewing is also spectacular. 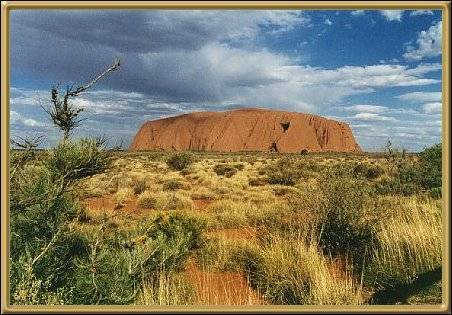 Uluru is the Aboriginal name for the rock. The Uluru - Kata Tjuta National Park Information and Cultural Centre is 1km from Ayres Rock on the road in from Yulara. Phone 08 8956 3138 or 08 8956 2299. There is an excellent Aboriginal art display and some carvings and art are for sale. Once at the rock many people make the steep climb to the top along the marked walking track with handrail. This takes 90 minutes return and not recommended for the unfit. The 10km walk around the rock takes 5 hours. 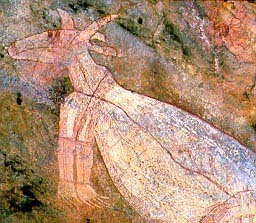 There are aboriginal cave paintings in places and three semi-permanent pools from the water run-off from the rock. The Olgas rock formations are actually taller than Ayres Rock and much bigger. Although the Olgas look like single huge rocks much like Ayres Rock from a distance they are not. Their geographic structure is very different. They are actually lots of tiny stones. Never the less the 36 giant domes and the valleys between them are spectacular. The 7km Valley of the Winds Walk provides the best views. The Olgas also has a sunset viewing area. Yulara is a purpose built resort town that will make your stay in this inhospitable landscape pleasant and fun. Accommodation ranges from 4-star all the way through to dormitory. There is also a caravan park, shops, supermarket, cinema, information centre and numerous restaurants in the various hotels. Everything is within easy walking distance of each other. All prices at Yulara are notoriously expensive due to the extreme remoteness of the location and resulting high transport, labour and construction costs. Alice Springs, the nearest town of any significance is 446km away. This is a complete listing of Yulara accommodation. All are on the circular Yulara Dve. All are run by the same company and have a central booking phone number 02 9360 9099. This is a Sydney number. The youth hostel type accommodation (and all the outback atmosphere) is at the Outback Pioneer Hotel. Outback Pioneer Hotel 125 3-star double rooms at $256 per night, 12 cabins with communal bathroom but own fridge accommodating up to 4 are $116 per night, a bed in one of two 40 bed bunkhouses is $21. Pool, barbecue, restaurant, food kiosk, take away liquor outlet (noon to 7pm only). Lots of young backpackers stay here and the open air dining area is the happening place at Yulara. The place has great atmosphere and is quite busy. There is a very popular kiosk that sells meat that you cook yourself on their big barbeques with everyone else. You can buy and cook yourself authentic Australian outback kangaroo, emu or buffalo steak, crocodile kebabs, barramundi fish or the more conventional beef steak or hamburger patties. Salad and vegetable buffet is included in the price of $13 to $17. Then sit down to eat it at the authentic open air dining area with everyone else at long wooden tables washing it down with a couple (or more) Australian beers from the bar while listening to the bush musician playing the Australian bush ballads on the banjo. This eatery is highly recommended for a great feed and great bush atmosphere. u u u u Sails in the Desert Large luxury hotel with elegant restaurants and bars with great views of Ayres Rock 18km away. 228 units. Double rooms are $350, extra child $20. Suits are $410-$630. Pool, spa, tennis court. u u u ² Emu Walk Services Apartments 56 one and two bedroom apartments accommodate up to 8 people. $260-$323. u u u Desert Gardens Hotel 160 units. Double rooms are $286-$330, extra child $20. Pool, half court tennis. Connellan airport is 5km north of town. Qantas and Ansett have flights to major Australian cities and Alice Springs ($200). Airnorth (phone 1800 627 474) flies between Yulara and Alice Springs too. Greyhound Pioneer and McCafferty’s have daily buses between Yulara and Alice Springs for $77 and take 5 1/2 hours. If coming from Adelaide you usually have to change buses at Erldunda. Both bus companies have 2 or 3 day package tours to Ayres Rock departing from Alice Springs. The Greyhound Pioneer 3 day tour includes Kings Canyon. Hertz (phone 08 8956 2244) http://www.hertz.com and Avis (phone 08 8956 2266) http://www.avis.com have offices at Connellan airport. Territory Rent-a-Car has an office at the Outback Pioneer Hotel. Other hotel receptions will also be able to help you. As Yulara is a remote location, book ahead for a car. If hiring a car for 3 days in Alice Springs to takes to Ayres Rock and back budget $500 (including insurance and petrol) or $600 if you also plan to go to Kings Canyon. Sunworth share-taxi will take you around $20 to and from Ayres Rock and $40 to and from the Olgas. Phone 08 8956 2152 and discuss with them what you want to see and do. Sunworth is much cheaper than an organised tour. Kings Creek has cut a deep Canyon (pictured) through the dry rocky landscape leaving 100m high red stone cliffs on either side of the Canyon. From the carpark the walk into the canyon along Kings Creek is like walking into a ferny oasis surrounded by a hot dry inhospitable landscape. If you keep walking beyond where the track deteriorates and scramble over the large boulders you will come to a rock pool with a waterfall that flows from high above. Allow 1-2 hours return. The Kings Canyon circular rim walk takes you up a steep ascent then along the north rim of the Canyon to the Garden of Eden near the top of the waterfall. There are spectacular views from the top of the cliff and lots of strange rocky sandstone domes. Allow 5 hours. By road it is 300km to Ayres Rock, and 475km to Alice Springs on the bitumen via Erldunda. Taking the rough unsealed Ernst Giles Rd to Alice Springs shortens the trip 330km. Ernst Giles road is impassable after heavy rain. For those with 4wds there is a back road to Alice Springs via Hermannsburg. Helicopter flights over the canyon are available from the Kings Canyon Resort (phone 08 8956 7873; $140 for 35 minutes) of the Kings Creek Station 36km away. There are very long day trips from Yulara at Ayres Rock. 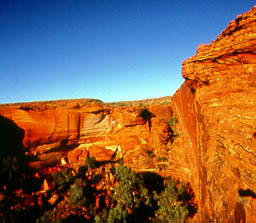 Some tours from Alice Springs include Kings Canyon. u u u ² Kings Canyon Resort is run by the same organisation that runs the Ayres Rock resort and has a variety of standards of accommodation. There are 96 double rooms for $208-$240 per night. Beds in the backpackers’ bunkhouse are $33 or $75 a double. Campsites are $25. Phone 08 8956 7442 or 1800 891 101. Facilities are pool, restaurant, cafe, bar, general store and petrol at $1.20 per litre. Kings Creek Station Camping Ground is 36km away just outside the national park. Its advantage is that campsites are cheaper at $8 per person. Phone 08 8956 7474. Petrol, limited stores, helicopter joyflights over Kings Canyon. They use the helicopter to round up wild camels at other times. The only bitumen road out of Ayres Rock is east on the Lasseter Highway returning to the Stuart Highway at Erldunda. South through the opal mining town of Coober Pedy, the army rocket launching township at Woomera to Port Augusta. Port Augusta road and rail interchange town with routes in every direction. Adelaide is then only 400km further south. Stuarts Well has petrol and a camping ground. Erldunda has a busy roadhouse at the junction of the Stuart Highway and Lasseter Highway which goes to Ayres Rock (Uluru) 260km east. u u Desert Oaks Motel Cnr Stuart and Lasseter Hwys. Phone 08 8956 0984. 54 units. Single $66, double $78, extra child $10. Pool, tennis court, laundry. Mount Ebenezer roadhouse sells petrol. Curtin Springs roadhouse sells petrol.